“This is the break through wildlife enthusiasts have been waiting for….new methods that really deliver low maintenance and consistent cricket breeding”. Like many reptile keepers I have previously tried to save money by breeding crickets and failed due to high maintenance and disease. I bought the book and emailed the author to find out when his next book was coming (cockroaches at the time). To my surprise the author contacted me directly and we had a chat. I knew from this conversation he knew his stuff and build his systems. 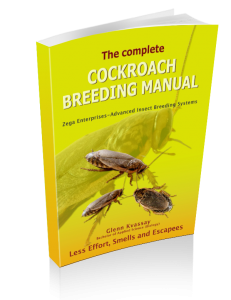 My first impressions when I received the book, was one of surprise that someone could produce so many methods and tips for breeding crickets. The book has hundreds of color photos and very clear instructions, so the making process was straight forward. All the materials I was able to source from my local hardware. After 6 weeks, the results were really impressive. The amount of crickets a single container can produce is really amazing, and they just keep coming through each week. I have since added additional containers which have really cut down the amount of feed I buy for my 100 geckoes, monitors and dragons. I have now been producing crickets with these methods for over 18 months and they work just as well now as when I started. The automated feeding and cleaning is really the key to its success, as few people have the time to replace these on a regular basis. 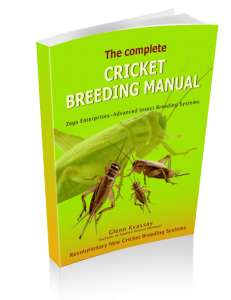 The books 9 chapters cover every aspect of cricket breeding, and again the photos really make the process really easy to understand. I did the Zega Substrate System (private and scale commercial), but have no doubt that if anyone did the large scale commercial system he recommends (Batch Breeding System) you would have success. As an extra bonus, I have been able to apply many of the methods to my cockroaches, so they are now even easier to maintain. I am very happy with my purchase, as it pays for itself each week. The author is really approachable, so I have no problems contacting him when I have a question by email/phone or Skype. In summary, I would say this book is not a literature review of existing methods, it really is a complete overhaul. The new methods really deliver low maintenance and consistent cricket breeding, which is a breakthrough for wildlife enthusiasts. If you want to save money, this book is a must for every reptile owner.